Out of the box, the new Coco platform – built to supercharge transaction speeds and simplify governance decisions – will be integrated with a number of popular open-source blockchains and distributed ledgers, including ethereum, R3’s Corda, Hyperledger Sawtooth and JPMorgan’s Quorum. But it’s the trusted security capabilities that Microsoft Azure CTO Mark Russinovich positioned as key to making the platform more than just an improvement of degrees. In addition to integration with Microsoft’s own software-based trusted execution environment, Russinovich said the framework can be made compatible with Intel’s hardware-based software guard extensions, known as SGXs. As more companies look to convert these open-source technologies into enterprise-grade solutions, he further positioned the new platform as one that would accelerate time to market and simplify management after they go live. 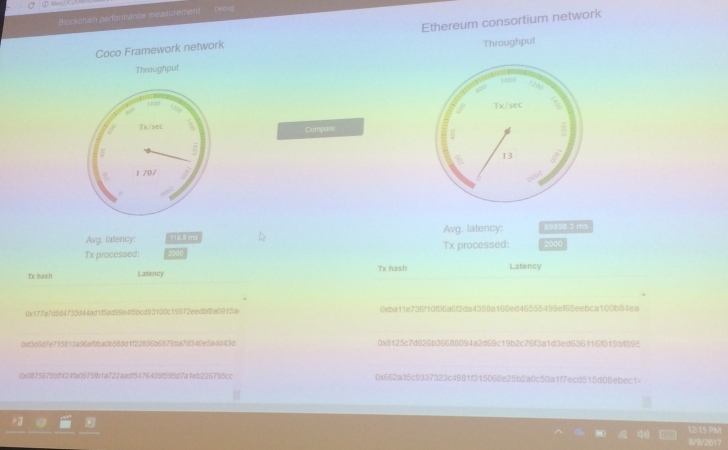 In the first-ever live demo, the framework resulted in an increased volume of 1,700 transactions per second on a private version of the ethereum blockchain. The average transaction volume of blockchains integrated with Coco (short for “confidential consortium”) is about 1,600 transactions per second, and it features a built-in governance model that lets consortia members vote on all terms and conditions of a network, including when members can be added or ejected. While the framework is capable of being powered by the Microsoft Azure cloud-computing offering, the open-source code can be run from any cloud platform or on-site, the company said. The framework was revealed in tandem with the publication of a white paper outlining how Coco is designed to integrate with a wide range of blockchains and distributed ledgers. Going forward, it will be formally contributed to the open-source community next year, when it is published on GitHub. 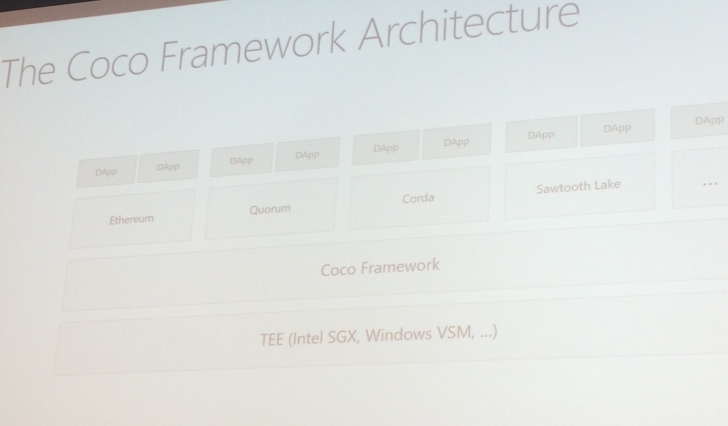 Stepping back, Coco is the latest development in Microsoft’s strategy to provide increasingly advanced services for companies seeking to turn open-source blockchain code into enterprise-grade products. In late 2015, Microsoft made its public entrance into the industry with its blockchain-as-a-service tool kit for a number of open-source platforms. Since then, the company launched Project Bletchley, designed to simplify the creation of blockchain consortia, and it has unveiled plans for enterprise-grade smart contracts. With the release of Coco next year, Russinovich said users will be able better balance the trade-offs experienced by companies of having to choose between performance and security when building on a blockchain. JPMorgan blockchain program lead Amber Baldet explained during a panel conversation at the demo why her company plans to use Coco, in spite of the fact that it created the original Quorum kernel. In two separate live demonstrations of the Coco Framework, both the speed and security of the technology were put on display. During a speed test, Coco achieved approximately 1,700 transactions per second using a private version of the ethereum blockchain, compared to about 13 transactions per second without the framework. The “main reason” for the improvement, according to Microsoft senior program manager Christine Avanessians, is that the blockchain was being processed in a trusted environment, allowing for a “simplified consensus mechanism,” in this case, RAFT. In the security demo, RFID company Mojix showed how Coco could be used to create permissioned access to a private version of ethereum that only lets certain participants view certain purchase orders, while ensuring the order was accurate.